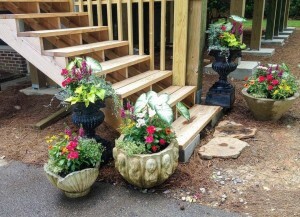 Owner, Billy Angell’s deck might not be finished yet, but his pots are! It’s high summer with the 4th of July just past… time for vacations and lazy days at the lake, the beach, or maybe just spent lolling by the pool with a good book. I’m off on a much anticipated vacation to visit family and friends too, but I wanted to share a few more plantings first. If you are off and away, be sure to make arrangements for a friend to tend your plantings and container gardens so they’re as pretty when you return as when you left. No one wants to come home to a sad garden, after all. Flowers obviously add blooms for bees and butterflies. Pinkie used an assortment of flowers for a customer’s containers. She included pentas, lantana (The butterflies love them! 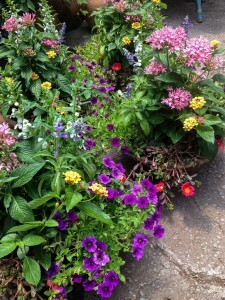 ), angelonia, million bells (calibrachoa), purslane, plumbago and salvias for loads of color. With plantings like this, it’s necessary to keep old blooms cut off (deadheading). Many of the container plantings we do are in light, mâché pots that can either be used on their own or placed in another planter. Here’s one with a mix of sun coleus, a dracaena (Barely visible in this picture, it adds a spiky leaf. ), lantana, red million bells to trail, and a white angelonia. This planting will get much larger and fuller as the heat of summer settles in, and daily watering will be necessary. The coleus will also need pinching back as it gets larger. This may seem difficult at first, but it’s really quite good for the plant and will allow it to grow fuller rather than getting leggy and scraggly. Think about it this way: Every time you cut it back, there will be two stems of colorful leaves rather than just one. It rewards you for your efforts! 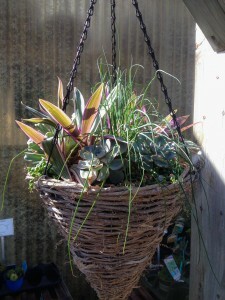 The white, cone-shaped hanging basket shown here is now home to a common houseplant, an herb, and some succulents. While it may seem an unusual combination, it’s working quite nicely and has a cool, summery look. The houseplant is a pink and green tradescantia (It’s also known as Rhoeo spathacea. ), sometimes called Moses In The Cradle. It’s keeping company with some succulent echevarias and trailing string of pearls, just beginning to peek over the edge of the basket in this picture. I added a pot of chives in the center, just for its spiky green leaves. This is hanging in the nursery waiting for someone to give it a home. 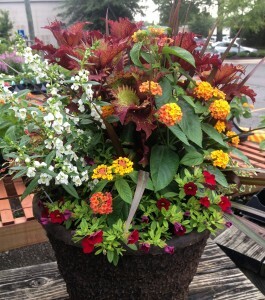 We have a few tall, lightweight planters still available, and this planting shows one of them off. A tall, white ruellia (They’re sometimes called perennial petunia.) is combined here with a caladium whose leaves will get very large. The name of this one is ‘Garden White’, and it’s impressive! The large leaves will contrast nicely with the smaller leaves of the ruellia. 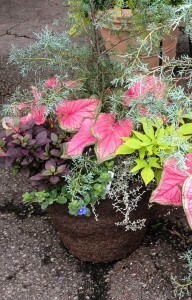 Another foliage contrast is provided by the silvery-purple leaves of a strobilanthes, sometimes called Persian Shield. A beautiful foliage plant, it benefits from a cutback every now and then if it gets to lanky in the planting. To trail there’s a blue fanflower, scaevola. Finally, since we had a few ‘Carolina Sapphire’ cypress left, they were candidates for a planting using smaller plants at the base to add fullness, color, and trail. These planters will be in the sun and can be changed out in the fall with the addition of pansies and other cold weather plants for the winter season. For now, though, the underplanting includes dwarf ‘Sweetheart Pink’ caladiums, trailing blue daze, lime green potato vine, a new silver helichrysum, and the purple foliage of an alternanthera ‘Little Ruby’. Watering, clipping out caladium seed pods (It’s best to cut them off so the energy of the plant goes toward making new leaves. ), and keeping the potato vine cut back (if desired) will be needed. These are just a sampling of the plantings we’ve done this season. Plants that are available from growers change rapidly, and so do our offerings. Hopefully you’ve planted a few pots this summer and are enjoying them now! This entry was posted in Annuals, Container, Container Gardening, Flowers, Herbs, House Plants, Planting Tips, Succulents, Summer and tagged caladiums in planters, combining plants in pots, container combos, container gardening, container gardening maintenance, container planting, containers with mixed flowers, succulents in containers on July 8, 2014 by Kris Blevons.